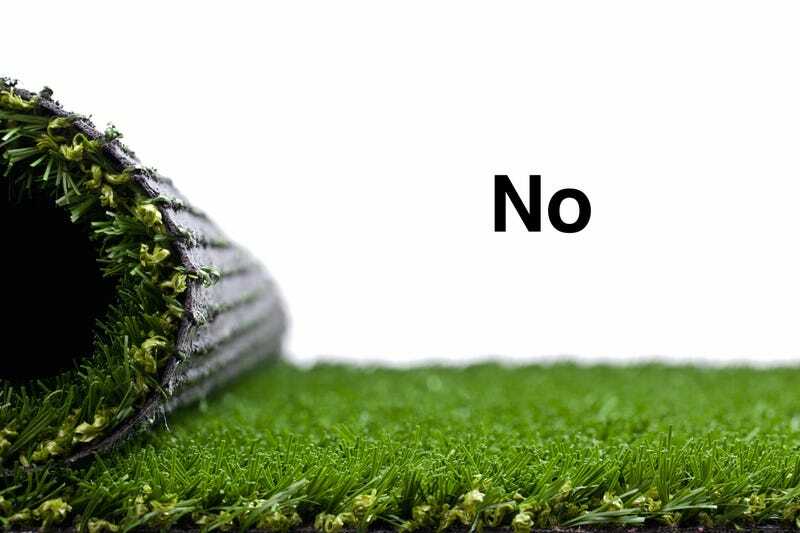 Quit Astroturfing Your Lawns, California—Just Get Rid of Them. There’s an insidious message being delivered to drought-hit Californians: You can have your lawn, and your water too, with a little help from synthetic grass. But, no, be bold, California! Don’t double-down on a failed experiment. It’s time to tear down your lawns. Each and every last one of them. In the conversation about California’s once green, but rapidly browning lawns, a suggestion has been popping up: Why not fake grass? It’s so lush and green, they say. Celebrities love it, they wheedle. It’s not like the Astroturf you remember, they whisper, it’s something fresh, something new. Astroturf was patented in 1967 under the only slightly less appealing tag Chemgrass. It was briefly, but zealously, pitched as the lawn of the future, until people began to catch on to what we now all know to be true: Being outside is a lot less fun when the whole thing has been carpeted. But wait, insist the synthetic-grass pushers, today’s version is not like the old, Nixon-era Chemgrass. This version is more lifelike—more grasslike—with color variation, a less uniform height, and a feathery-light structure. The real problem, though, is not just the (unpleasant) feel or the (gross) color or the (creepy) texture. It’s that lawns belong to a world we don’t live in anymore. The society that designed those lawns, and the environment that they made sense for, simply no longer exist. Our world is hotter than it used to be and the level of rain that we used to depend on can’t be counted on. This is not a fluke. It’s not temporary. And it’s not going to go back to the way it was, ever. Instead of trying to approximate the world we once had, and lost, it’s time to figure out what’s next. What could you have instead of a lawn? Plenty. Build yourself a rock garden. Settle in a nice ring of cacti. Pave the whole thing over, paint in some lines, and live in the middle of that roller rink you’ve always dreamed of. You choose! But don’t hide behind an unsettlingly-green thicket plucked straight from the uncanny valley of vegetation, just because it looks a little like what we used to imagine as a home. No, be brave. Be practical. Be inventive. And get rid of your lawns, so that we can finally imagine something new.